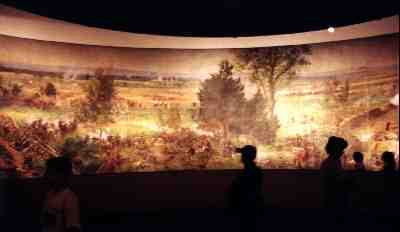 A Cyclorama gives a 360 degree view. What the heck is a cyclorama? Isn't that a building where they race bicycles? (No, that's a cyclodrome). A cyclorama (from the Greek words cycl to circle and orama to view) was the 19th century's version of virtual reality. 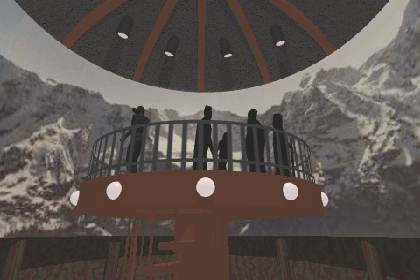 Back then artists tried to give their viewers the 3D/surround effect now associated with virtual reality by painting a large-scale, realistic scene on the inside of a cylinder. Standing in the middle of the cylinder, a viewer would feel as if he was seeing a distant place, or observing a long-gone event in person, because the image wrapped around him filling his vision. The idea was patented by an Irish painter named Robert Barker. The story goes that the invention occurred to him when Baker was out climbing a hill in the city of Edinburgh, Scotland. When he reached the top and saw the city spread out around and below him Barker decided he'd like to find a way of capturing the view. He opened his first cyclorama in Edinburgh in 1787. Dozens of cyclorama buildings, either circular or hexagon-shaped, were constructed in cities throughout North America and Europe by the late 1800's. The paintings would often stay at a location for one or two years, then were moved out and another brought in to replace it. Popular subjects often included civil war battles or works of nature such as Niagara Falls. To observe the cyclorama you will need either a Java compatible browser, or a Live Picture plug-in. Unfortunately, Live Picture Inc has gone out of business and there is no place to download the plug-in from if you do not already have it. The cyclorama images are larger in size than normal images and may take a longer time to download. Interest in cycloramas faded after the turn of the century as the motion picture began to take public attention. Many of the buildings were torn down and the paintings destroyed or cut up into smaller works of art (the National Park Service is still looking for pieces of the "Battle of Manassas" - if you find a swatch of it in your grandma's attic, give them a call). A fine depiction of the Chicago fire painted in the 1890's for $250,000 was sold to a junk dealer for only two bucks in 1913. Several of the most famous surviving cyclorama paintings are "Pickett's Charge" (painted in 1884 depicting the events of the Battle of Gettysburg) now located at Gettysburg, Pennsylvania, and "The Battle of Atlanta" in Atlanta, Georgia. The "Cyclorama of Jerusalem," which was finished in 1895 and depicts the crucifixion of Christ, is still operating near Quebec, Canada. An unusual cyclorama showing "Dante's Hell" continues on display in Europe. In all, about 30 or so cycloramas still exist today. Cycloramas were often very large in size (the Cyclorama of Jerusalem is 46 feet high and 361 feet in circumference) and would be observed from the center on a raised platform. Some even blended the floor of the room into the picture and added cutouts of foreground objects to heighten the effect. The Cyclorama at Gettysburg features "Pickett's Charge." In 1896 a Chicago inventor took the cyclorama to the next step by using eight projectors to display images on a surrounding screen. The invention wasn't popular, but reappeared in the 1960's in a slightly different version when Walt Disney used a round theater and a bank of motion picture projectors to create a motion picture relative of the cyclorama he called Circlevision. The UnMuseum now features its own virtual cyclorama through the use of technology from Live Picture, Inc.. The virtual cyclorama consists of a frame through which you can observe a 360 degree panoramic image by using your mouse to drag the image left or right and up or down as if you were turning your head at a real cyclorama. Copyright Lee Krystek 1998-2003. All Rights Reserved.